Hong Kong Freedom of Press under attack by CY Leung (HKSAR Chief Executive)? Is Freedom of Press in Hong Kong under severe attack by HKSAR Chief Executive Mr. CY Leung as Ms. Li Wei Ling 李慧玲 (FB page) alleged? You be the judge yourself after watch the full press conference. 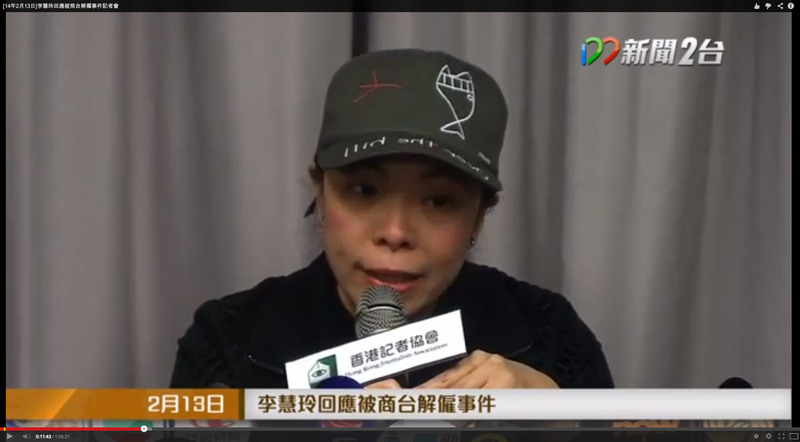 I personally believe Ms. Li Wei Ling 李慧玲 is a person of the highest integrity through her years of journalistic work. Have a watch of the clip 李慧玲回應被商台解僱事件記者會 starts at 1m23s (full press conference with Q&A on 2014/02/13, over 1 hour long) and judge for yourself. Oct 15, 2015 update: It is with deep sadness that I report the passing of Ambassador Ken Taylor at 81. CTV News report with video. Global News report (with video). “90 percent of the contributions to the ideas and the consummation of the plan was Canadian. And the movie gives almost full credit to the American CIA. And with that exception, the movie is very good.” — Former President Jimmy Carter on Ben Affleck’s movie ‘Argo’ to CNN’s Piers Morgan. Many people (including me) are predicting Argo will likely win Best Picture in The Oscars tonight. So no time is better than now to set the record straight and urge Mr. Ben Affleck, director/actor of Argo to thank Canada and Canadians in his Oscars acceptance speech. If I may be frank and honest, Mr. Ben “WTF” Affleck, enough is enough. Your drama license to twist history to enhance your story telling makes this and other Canadians angry. What will Americans feel if filmmakers from UK or France rewrite history in a “based on real events” movie and minimize the US effort in World War II? Ben, Man up and thank Canada and Canadians in your Oscars speech tonight. If not, I’ve decided to change your name to Ben “WTF” Affleck! “The original postscript of the movie said that Taylor received 112 citations and awards for his work in freeing the hostages and suggested Taylor didn’t deserve them because the movie ends with the CIA deciding to let Canada have the credit for helping the Americans escape. Taylor called the postscript lines “disgraceful and insulting” and said it would have caused outrage in Canada if the lines were not changed. Affleck flew Taylor to Los Angeles after the Toronto debut and allowed him to insert a postscript that gave Canada some credit. Taylor called it a good movie and said he’s not rooting against it, but said it is far from accurate. 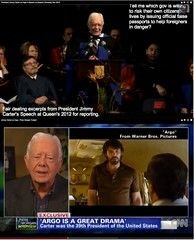 The full convocation video with President Carter. (portion related to Argo, ~25:55 – 28:15) Queen’s University press release. “MORGAN: A scene from the Oscar-nominated film, Argo, about a daring rescue during the Iranian hostage crisis. I’m back now with former President Jimmy Carter, who was, of course, in the White House at the time. You’ve seen Argo, I take it? How accurate is it from your memory? CARTER: Well, let me say first of all, it’s a great drama. And I hope it gets the Academy Award for best film because I think it deserves it. The other thing that I would say was that 90 percent of the contributions to the ideas and the consummation of the plan was Canadian. And the movie gives almost full credit to the American CIA. And with that exception, the movie is very good. But Ben Affleck’s character in the film was only — he was only in — stayed in Iran a day and a half. And the main hero, in my opinion, was Ken Taylor, who was the Canadian ambassador who orchestrated the entire process. MORGAN: But when you first heard about this outlandish plan to create a fictitious science fiction movie to get these hostages out, you’re the president of the United States. I mean, if this had gone badly wrong, you would have been an absolute laughing stock. So it’s a bold moment for you, for the presidency, for the country. This article is cross posted in examiner.com by me. 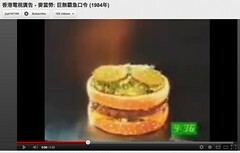 The following are videos of 1984 McDonald’s Big Mac commercials in US (I believe) and Hong Kong respectively. To me, the Cantonese campaign actually trumped the English one! The HK commercial actually came as a part of a really smart campaign. 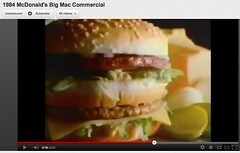 And in hindsight, it can also be said that it was part of a campaign to “brainwash” HK kids with the virtues of Big Mac! How so? Well, HK kids were asked to memorize and recite a promo about the virtues of Big Mac in less than six seconds (see following Cantonese ad), in exchange for a FREE Big Mac! I and many HK kids recited the promo in less than six seconds with flying colours! I didn’t know then, but in hindsight if this campaign didn’t fall under “brainwashing” I don’t know what would. Yes, in case you ask, after all these years, I still can recite the Cantonese Hong Kong Big Mac promo in less than five seconds (not six)! In Canada (I am less sure about US), we now have advertising/marketing guidelines as to what we can do to advertise to young children, and I am happy to say there are forms of advertising we don’t allow any company to do to influence the mind of young ones. P.S. Setting aside ethics and morality for a moment, the Hong Kong advertising/marketing team did one heck of a job in improving upon the original US ad concept. Translating the language and culture of an ad is almost impossible but improving upon was really pushing everything one level up! Great job even I had to set aside ethics and morality to praise the original 1984 HK McDonald’s Big Mac team. The conflicts in reality TV as we seen in the most recent “old days” were created by show creators’ or casting directors’ gut instinct. They put interesting people or people with opposing characteristics on a show and “hope” for the best. The Chicken or The Egg – Casting for Reality session at 2012 Banff World Media Festival gave me a deep and insightful insider look of the current practice in casting for reality TV. Psychological personality tests like the Minnesota Multiphasic Personality Inventory (MMPI-2) are used to precisely create (I debate using the word “manipulate”) the reality TV casts composition to manufacture the right mix for “fireworks” to happen on screen. I agree that tests like MMPI-2 will help screened out extreme contestants that should NOT to be allowed on TV in order to protect themselves from potential harm (sometimes self-inflicted). In some sense, even the contestants have probably signed their lives away and give up any rights to launch any legal actions if anything go wrong (an analogy is the forms you have to sign before your parachute jump), the reality TV shows makers should be more aware and ready to provide help to the contestants when troubles arises. The speakers of the session are aware the duty of care they are responsible of, even though they may not be legally bound to. Have a watch of the follow video clip and share your thoughts. Since we are talking about reality TV, Ricky Gervais, winner of the Sir Peter Ustinov Award for Comedy at the 2010 Banff World TV Festival, had an interesting take in the finale of Extras (highly recommended funny comedy). I was lucky to ask Ricky specifically about the finale. Here is a clip. Official The Chicken or The Egg session description from 2012 Banff. Uncovering the characters in reality television can be a challenge as producers search for engaging and genuine subjects. In this behind-the-scenes look at the nuances of discovering incredible individuals to participate in this ever growing genre, you will hear first-hand from a producer and personality expert from some of the hottest reality shows. They will discuss the fine line between creating television that is entertaining, yet not exploitative, that presents the nitty-gritty of real-life drama. What is the creative process in finding the characters that drive our favourite reality shows? What are some of the challenges in putting together the perfect ensemble cast of characters? Official 2012 Banff bio for Jonathan Glazier. Did Bloomberg distort Apple Co-Founder Steve Wozniak’s view on Facebook as an investment? Here is an edited version of a request for clarification sent to Bloomberg reporters and editor for the May 13th, 2012 story “Apple Co-Founder Wozniak Would Buy Facebook At Any [Price]“. I was in touch with Apple Co-Founder Mr. Steve Wozniak electronically yesterday [see lengthy exchange in this public post’s comments]. 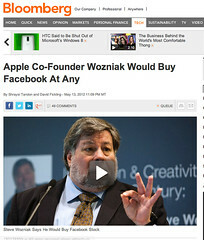 And I was very disturbed to hear Mr. Wozniak telling me his view on Facebook “investment” had been distorted by Bloomberg. At the core, Mr. Wozniak told me that he made it clear to Bloomberg’s reporters that any purchase of Facebook shares would be just “ceremonial” (he gave the analogy, like “waiting in line for iPhones“). The following are Mr. Wozniak’s words. Emphasis are added by me to draw your attention. To me, Bloomberg’s reputation is on the line here. Distorting a “ceremonial” purchase of Facebook stocks and turning it into a story with title “Apple Co-Founder Wozniak Would Buy Facebook At Any [Price]” is a serious journalist blunder at least or an inexcusably unethical behaviour at worst. Finally, Ms. Shraysi Tandon, Mr. David Fickling, and Mr. Michael Tighe, I hope if there was a mistake, Bloomberg will do the honourable thing and issue a formal correction and apologize. Since you are all professional journalists, I don’t need to remind why we in the business of reporting will all remember Jayson Blair (former reporter with New York Times) or Stephen Glass (former reporter with The New Republic) for a very long time to come. Please kindly recheck the source and basis of your story and issue a correction and apology if a mistake was made. Please let me know an error was indeed made, I would like to promptly issue my apology to Mr. Wozniak in saying his “investment “advice” was worst than idiotic” based on Bloomberg’s May 13th report. P.S. Cross posted onto examiner.com. I am hoping to hear from Bloomberg really soon to set the record straight.